Napoleon Bonaparte left a legacy that military historians can’t help but to marvel at. Dominating most of continental Europe in 60 major battles, he single-handedly influenced the region’s political affairs for nearly two decades. He also forever changed the conduct of warfare in the West; so far-reaching was his influence that his campaigns continue to be studied 200 years later in military schools across the globe. And it was there, near the rye fields around Mont St. Jean on June 18, that his career finally met its end. The Allied Army of the U.K., Prussia and the Netherlands finally defeated France’s master tactician, ending his rule as Emperor and his Hundred Days return from exile. How did this happen? How did such a storied and celebrated military commander lose a campaign so completely? Would you believe that it was a foregone conclusion? 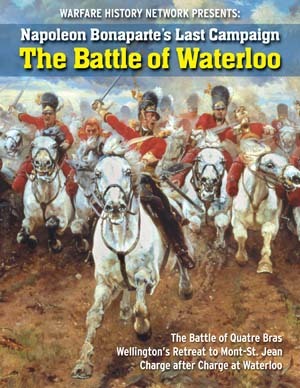 Inside our free briefing, “Napoleon Bonaparte’s Last Campaign: The Battle of Waterloo,” you’ll hear all about the doomed Army of the North, and the series of events that ensured their ultimate demise. The French plan for the opening of their 1815 campaign was vintage Napoleon: seize the initiative by attacking Allied forces closest to their borders, separate them by assuming the central position, and divide and conquer accordingly. It came as no surprise, then, that the initial blows directed by Napoleon’s army would be against Allied forces in the Netherlands: both the Duke of Wellington’s mixed army and Field Marshal Blücher’s Prussian Army of the Lower Rhine. He was swift and strategic with his opening skirmishes—both the Battle of Quatre Bras and Ligny, fought just eight miles apart, ended around 9 PM on June 16. Battle losses were high for the French—12,000 from various causes—but the Allies had it worse: 16,000 Prussians killed, wounded or missing with a further 8 to 10,000 deserted. They were going to have to fall back. To some, the advantage may have appeared to be Napoleon’s, but as you’ll learn inside, it may have been the Allies’ retreat that ensured their later victory. Napoleon’s army fought bravely in their final battle, stubbornly contesting the field for hours while being overwhelmed, but it was perhaps his cavalry that distinguished itself the most. Against all possible reason or support, they threw themselves back into the fray seven or eight times in the course of two and a half hours of grueling battle. And as you’ll learn inside, their tenacity and valor didn’t go unnoticed by the Allies. Now, 200 years later, Napoleon remains one of the most controversial historical figures the West has ever known. His supporters point to his lasting reforms, bringing higher education, a modern tax code and a strong infrastructure into France. His detractors call him a usurper, plunderer and tyrant, caring little for the lives of those under his command. Regardless, in a few decades’ time he was able to shape the course of Europe forever onward. We hope you’ll enjoy this free briefing on the Battle of Waterloo, and after reading it you gain some new insight into Napoleon’s complex and colorful legacy. And please, let us know what you think in the comments section; we’d love to hear how you liked it. I am a history buff! As a retired veteran, I am a complete history buff, military and otherwise.Too bad we don’t learn from our mistakes.